Birthdays are a pretty big deal in our house. We tend to gush a bit over the birthday kid, even when one is so close to Christmas. 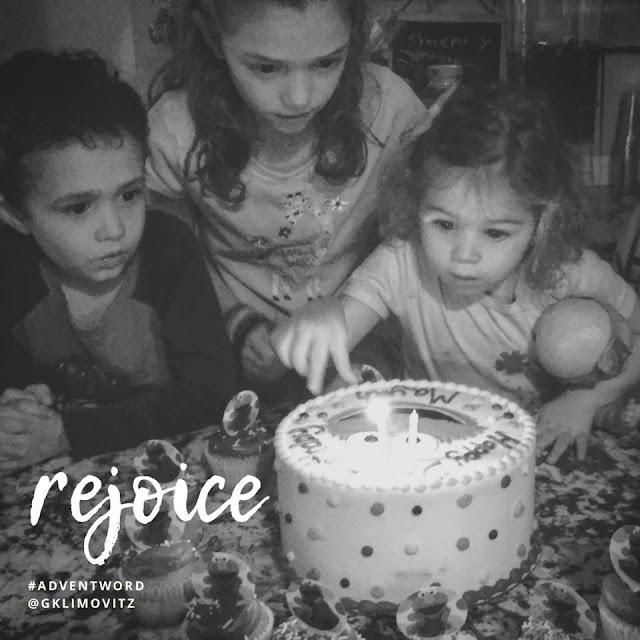 In the midst of a circus life, it is important to us to stop and REJOICE over the one among the many. The biblical story is full of calls to rejoice. The invitation to jubilation was beyond sentiment; to celebrate was to affirm no matter where they lived, who was in political power, or the threats posed by social and economic circumstances, God’s steadfast love abounded and would be with them. In this light, whether Mary or the shepherds, we are able to see their rejoicing as resistance to the fear, angst, and narratives of scarcity or oppression that regularly threatened God’s people. They refused to surrender celebration, because to rejoice was to defy despair, resist the grips of empire, and affirm again God’s everlasting promises. So this season, and every season, dare to shout “hosanna in the highest,” and do so as protest against whatever shadows or systems infringe upon God’s dreams for this beloved world.